Meta tags describe website content. They are useful for both users and internet searches. In terms of SEO, the most important meta tags are title and description. In this article, you will learn how to build a website with meta tags, which will improve your positioning. Meta tag "Title" should describe your website content and it shouldn't be longer than 60 characters. If you run a hair salon in Brighton the title should be more or less "Hairstylist Brighton"/"Hair Salon Brighton". The title tag is not only important of internet searches, but it is also displayed as a tab name in a browser and helps users remember where they are at. Meta tag title is also displayed as a headline of your website in internet search results. Meta tag "description" is a text which describes your website content. Even though internet searches don't really pay attention to description tag, it is often displayed in internet search results and allows users to decide whether to enter your website and if it is relevant. 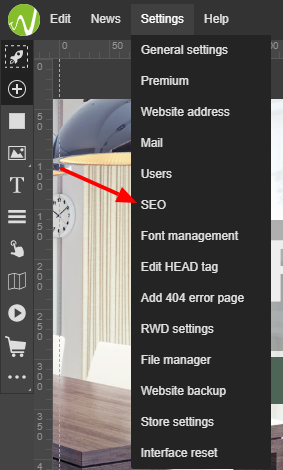 In order to set meta tags, enter website builder WebWave and in "Settings" select "SEO". In settings, you can also separately set default meta tags for your subpages. 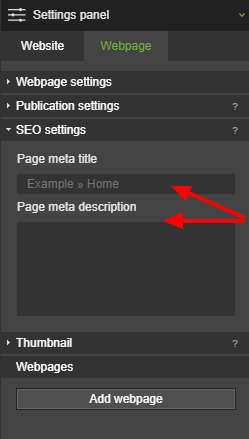 Default meta tags mean title and description which will be displayed if meta tags of particular subpage haven't been set yet. Of course, it is better then each subpage has set its own title and description. Set meta tags separately in Settings Panel in "Newspage".